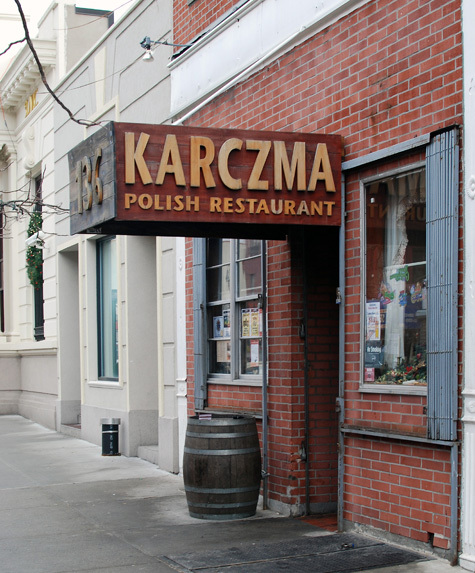 Karczma, which means inn in Polish, is a nice little restaurant that opened in 2007 and was voted best Polish of 2008 by the Village Voice. It is located near the Greenpoint Avenue subway stop, and also a convenient car service. The interior intends to reproduce a farmhouse: waitstaff wear traditional dresses and the decor is resolutely peasant kitsch. 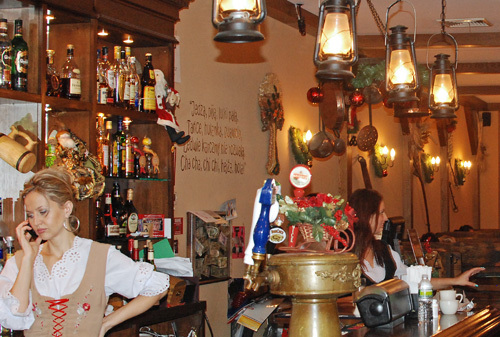 We were happy to notice that the menu is almost 100% Polish. This means a lot of pork and potatoes. And large plates. 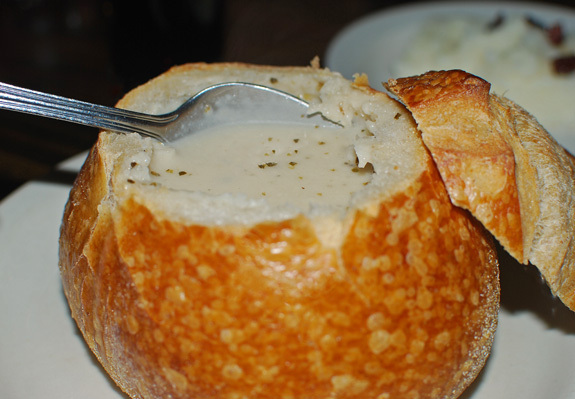 For starters, the white borsch, a soup made from soured wheat flour and kielbasa and served in a bread loaf, was delicious, with a pleasant smoked flavor. The dish also came with a rather unnecessary side of mashed potatoes garnished with bacon, making it a complete lunch meal in itself. Each specialty, though not spectacular, was well executed. The stuffed cabbage had an airy and tasty meat filling and was topped with the usual tomato sauce. 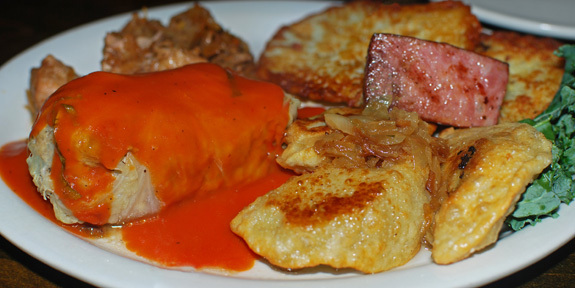 The fried pierogis came in two types, potato and meat. The bigos (hunter’s stew) consisted of tender but slightly stringy meat cooked with sauerkraut. The potato pancakes were crisp and oniony. Of course, there was a piece of fatty kielbasa to top it all off. Pig was definitely the star of the plate. 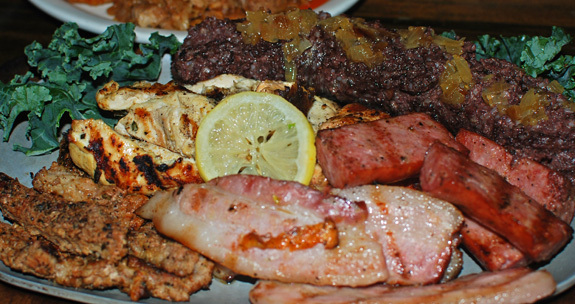 The bacon and kielbasa were juicy and smoky. The grilled shoulder managed to be moist as well, but was a bit hard to chew. The blood sausage, made with pig’s blood and buckwheat and topped with grilled onions, tasted very good but could have been prepared with less buckwheat and served warmer. (For those of you craving for a quick offal snack for lunch, the blood sausage also comes in a sandwich.) The salmon and the chicken breast, however, were dry and disappointing. If I remember correctly, the dish was also accompanied by roasted potatoes, sauerkraut and three sauces — barbecue, garlic and horseradish. We pushed the bravado and even had another serving of pork shoulder, called karkowka, this time all by itself with a few grilled vegetables and fries. 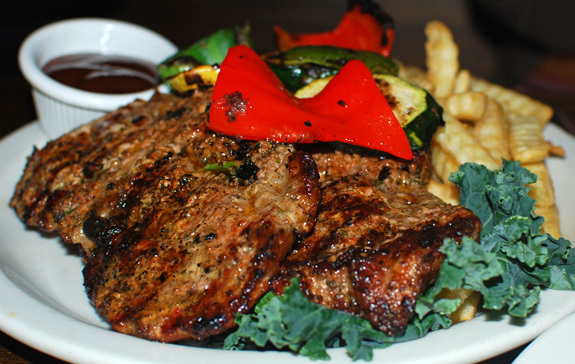 These larger steaks were juicier than the ones above, with a nice grilled taste. We didn’t really have room for dessert, and anyway the menu was limited to a couple pancake dishes and diner standards. All in all, the food was authentic and rather good, for a very reasonable price. There’s also an affordable selection of Polish vodka, though the waitress must have thought me an alcoholic, as she brought all my vodka in one tumbler almost filled to the brim. And don’t forget to go kielbasa shopping while you’re in the neighborhood! UPDATE: I revisited this restaurant here. I am sorry to say that, but all the dishes look awful and I hate this style of the presentation :(. Is there any modern restaurant serving new Polish cusine in NYC? Florian, I agree – it looks awful ! Some chefs cooks in Poland like that: http://tastycolours.blogspot.com/2012/08/will-next-big-cuisine-be-in-poland.html. Have a good weekend ! Got it, WordPress was showing me your comment out of context when I read it!